In other words, “hard” as actual US borders are becoming, what might be called our global, or perhaps even virtual, borders are growing ever more pliable and ever more expansive—extending not only to places like the Dominican Republic, but to the edges of our vast military-surveillance grid, into cyberspace, and via spinning satellites and other spying systems, into space itself. Washington’s response to the 2010 Haitian earthquake provides one example of how quickly a mobile US border and associated fears of massive immigration or unrest can be brought into play. In the first days after that disaster, a US Air Force cargo plane circled parts of the island for five hours repeatedly broadcasting in Creole the prerecorded voice of Raymond Joseph, Haiti’s ambassador to the United States. That disembodied voice from the heavens was addressing Haitians still stunned in the wake of an earthquake that had killed up to 316,000 people and left an additional one million homeless. State Department Deputy Spokesman Gordon Duguid explained the daily flights to CNN this way: “We are sending public service messages… to save lives.” Meanwhile, the Department of Homeland Security (DHS) quickly dispatched 16 Coast Guard cutters to patrol Haitian waters, blocking people from leaving their devastated island. DHS authorities also cleared space in a 600-bed immigration detention center in Miami, and at the for-profit Guantanamo Bay Migrations Operation Center (run by the GEO Group) at the infamous US base in Cuba. In other words, the US border is no longer static and “homeland security” no longer stays in the homeland: it’s mobile, it’s rapid, and it's international. This booming business thrives off the creation of new border patrols globally. The Dominican Republic’s CESFRONT, for instance, did not exist before 2006. That year, according to Dominican Today, a group of “US experts”reported that there were “a series of weaknesses that will lead to all kinds of illicit activities” on the Haitian-Dominican border. The US team recommended that “there should be helicopters deployed in the region and [that] there be a creation of a Border Guard.” A month after their report appeared, that country, by Dominican presidential decree, had its own border patrol. By 2009, the new force had already received training, funding, and resources from a number of US agencies, including the Border Patrol itself. Somehow, it seems that what the US consulate calls “strong borders” between the Dominican Republic and the hemisphere’s poorest country has become an integral part of a terror-obsessed world. Jerez is not alone. Washington’s global boundary-building, its promotion of those strong borders, and its urge to preempt “terrorism against American interests ‘over there,’” as the 9/11 commission report put it, are spreading fast. For example, the Central American Regional Security Initiative, a $496 million US counter-drug plan launched in 2008, identifies “border security deficiencies” among Central American countries as a key problem to be dealt with ASAP. So the US Border Patrol has gone to Guatemala and Honduras to help train new units of border guards. As in Central America, border patrolling’s most vibrant markets are in places that Washington sees as far too chaotic, yet where its economic and political interests reside. For six years now, US Customs and Border Protection (CBP) has sent its agents, clad in brown jumpsuits, to Iraq’s borderlands to assist that government in the creation of a force to police its “porous” borders (where chaos has indeed been endemic since the 2003 US invasion and subsequent occupation of the country). US boundary-building efforts began there in 2004 with an operation labeled “Phantom Linebacker” in which 15,000 border guards were trained to patrol in—as the name of the operation indicates—the spirit of American football. 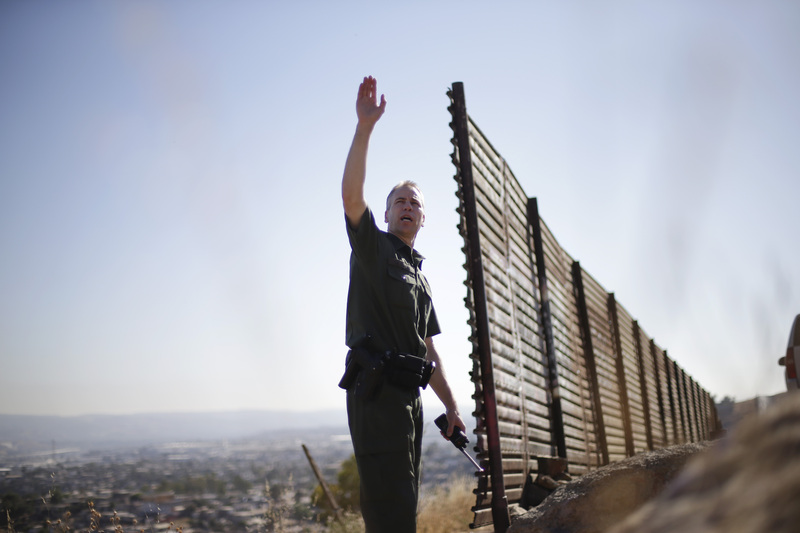 In 2012, agent Adrian Long told Frontline, the CBP's in-house magazine, that his agency trains Iraqis “in Border Patrol techniques like cutting sign, doing drags, setting up checkpoints and patrols.” Long was repeating the same lingo so often heard on the US-Mexican border, where agents “cut sign” to track people by their trail marks and do “drags” to smooth out dirt roads so they can more easily see the footprints of any “border intruders.” In Afghanistan, Border Patrol agents are similarly training forces to police that country’s 3,436 miles of frontiers. In 2012, during one training session, an Afghan policeman even turned his gun on two CBP agents in an “insider attack,” killing them and seriously injuring a third. Around soccer’s World Cup, which South Africa hosted in 2010, CBP assisted that government in creating a Customs and Border Control Unit tasked with “securing South Africa’s borders while facilitating the movement of goods and people,” according to CBP’s Africa and Middle East branch country manager for South Africa Tasha Reid Hippolyte. South Africa has even brought itsmilitary special forces into the border patrolling process. Near the Zimbabwean border, its militarized guards were using a triple barrier of razor wire and electric fencing that can be set to offer shocks ranging from mild to deadly in their efforts to stop border crossers. Such equipment had not been used in that country since the apartheid-era. In many cases, the US is also training border forces in the use of sophisticated surveillance systems, drones, and the construction of fences and barriers of various kinds, largely in attempts to clamp down on the movement of people between poorer and richer countries. More than 15,000 foreign participants in more than 100 countries have taken part in CBP training sessions since October 2002. It is little wonder, then, that an L-3 Communications sales rep would shrug off the constraints of a shrinking domestic national security budget. Meanwhile, US borders are functionally being stretched in all sorts of complex ways, even across the waters. As Michael Schmidt wrote in the New York Times in 2012, for example, “An ocean away from the United States, travelers flying out of the international airport here on the west coast of Ireland are confronting one of the newest lines of defense in the war on terrorism: the United States border.” There, at Shannon International Airport, Department of Homeland Security officials set up the equivalent of a prescreening border checkpoint for air travelers. Whether it is in your airports or, as in Haiti’s case, in the international waters around your country, the US border is on its way to scrutinize you, to make sure that you are not a threat to the “homeland.” If you don’t meet Washington’s criteria for whatever reason, you will be stopped, forcibly if necessary, from entering the United States, or even in many cases from travelling anywhere at all. As dusk falls and the rainstorm ends, I walk along the river’s edge where those Dominican border patrol agents are still sitting, staring into Haiti. Considering that US forces occupied the Dominican Republic and Haiti numerous times in the previous century, it’s easy to imagine why Washington’s border chieftains consider this sad, impoverished spot part of our “backyard.” Not far from where I’m walking is the Codevi industrial free trade zone that straddles the border. There, Haitian workers churn out jeans mainly for Levi Strauss and the North American market, earning less than three dollars a day. Diaz, as his name patch identifies him, tells me that his shift, which runs from 6 p.m. to midnight, is normally eventless because Haitians rarely cross here. When I explain where I’m from, he wants to know what the US-Mexico border looks like. I tell him about the fencing, the sensors, the cameras, and the agents everywhere you look. I ask if he has ever met agents of the US Border Patrol. Then I ask if terrorists are crossing this border, which is the reason the US consulate in Santo Domingo gives for supporting the creation of CESFRONT. No surprise there either. CESFRONT, like similar outfits proliferating globally, isn’t really about terrorism. It’s all about Haiti, one of the poorest countries on the planet. It is a response to fears of the mass movement of desperate, often hungry, people in the US sphere of dominance. It is the manifestation of a new vision of global geopolitics in which human beings in need are to be corralled, their free movement criminalized, and their labor exploited. With this in mind, the experimental border control technologies being tested along the US-Mexican boundary line and the border-industrial complex that has grown up around it are heading abroad in a major way. If Congress finally passes a new multi-billion dollar border-policing package, its effects will be felt not only along US borders, but also at the edges of its empire.